Short for personal digital assistant, a handheld device that combines computing, telephone/fax, Internet and networking features. A typical PDA ca n function as a cellular phone, fax sender, Web browser and personal organizer. 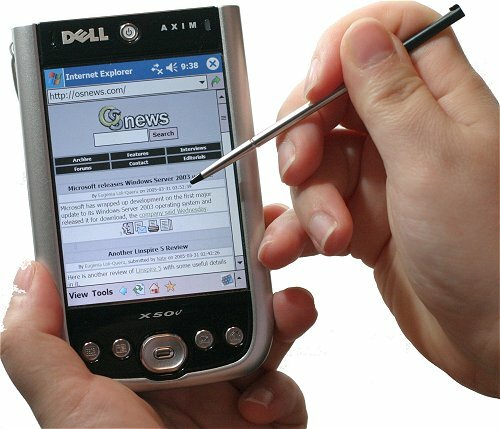 Unlike portable computers, most PDAs began as pen-based, using a stylus rather than a keyboard for input. This means that they also incorporated handwriting recognition features. Some PDAs can also react to voice input by using voice recognition technologies. PDAs of today are available in either a stylus or keyboard version. Apple Computer, which introduced the Newton Message Pad in 1993, was one of the first companies to offer PDAs. Shortly thereafter, several other manufacturers offered similar products. Today, one of the most popular brands of PDAs is the series of Palm Pilots from Palm, Inc.
PDAs are also called palmtops, hand-held computers and pocket computers.